Two long-tailed macaques (Macaca fascicularis) have recently become the new residents of ProFauna’s Wildlife Rescue Center (PWRC) since February 2013. The interesting story behind the new comers was that the monkeys were lost after being chased by come poachers. ProFauna team recorded that the monkeys came from the forest about five kilometers away from the center. The poachers who brought a couple of hunting dogs with them were notoriously and traditionally called ‘gladak’, poachers who hunt any kind of wildlife including primate, porcupine, civet, leopard cat, etc. The poachers with the dogs coming to the forest scared the monkeys and their groups so that they scattered and ran away. The dogs kept barking while the poachers were shooting at and running after the targets. Two monkeys that looked still young were separated from their groups and lost. They finally ended up at PWRC. 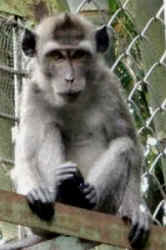 An animal keeper of PWRC knew the lost monkeys when he was about to feed Suki, a monkey rescued from Malang City after being shot by some people. The wild monkeys were pacing by Suki’s cage. Seeing the monkeys, the animal keeper was worried that the local farmers would catch them because PWRC was surrounded by plantations. The locals must have been upset because they thought the monkeys would eat their crops. The animal keeper then gave a food decoy to in front of Suki’s cage to the lost and confused monkeys. Surprisingly, the monkeys entered the cage. They have been taken care of passionately by PWRC’s animal keepers ever since. ProFauna team actually wanted to release them back right away to the forest but it would not be easy. To do so, we must know the groups of the monkeys and the forest is prone to wildlife poaching; we plan to release them someday to their forest homes.